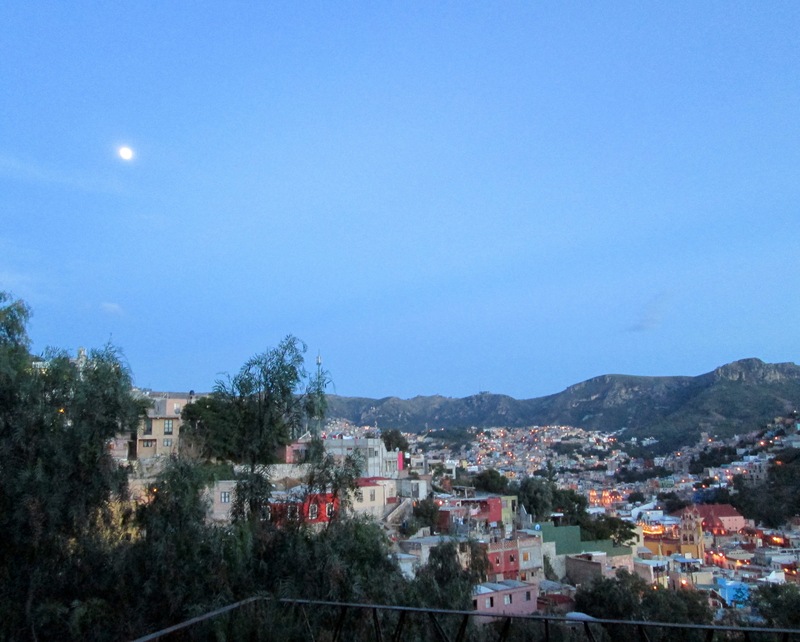 Sometimes, at night here in Guanajuato, I stand at the edge of this casa’s high terrace and admire what looks like millions of stars down below. It’s as if someone had tipped the overarching sky and poured all of its stars into the waiting bowl of this deep, wide, state-capital city. It’s as if I’m looking down, instead of up, at the starry sky. 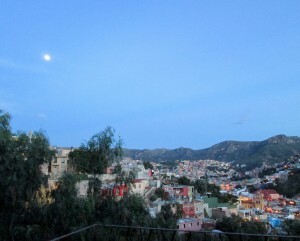 It’s a topsy-turvy view, but just one more magical aspect of this summer stay in central Mexico. This night vista makes me think of other starry – or starless – skies I’ve known in my life’s travels. For example: There were never any stars at night in the rainforested interior of Gabon, where I served in the Peace Corps. For two years I studied the night sky and saw only a charcoal-gray blanket of bloated clouds. In my post-Peace Corps years in Segou, Mali, on the other hand, the stars were so abundant and seemingly close it was as if, as one friend expressed it, they were “in your hair.” I actually put a bed on the rooftop of my rented house there so I could sleep every night under this dazzling celestial canopy, pulling the night sky around me like a bejeweled coverlet. In Paris, City of Lights, like New York, which never turns off its bed lamp to go to sleep, you’ll seldom see a star (unless you pass one on the street). But travel to any Greek island and be prepared to be awestruck by the firmament after sunset. Standing on this terrace in Mexico, I think about world travel and what it teaches us: That we all share the same sky, but what we see in it is different, depending on where we’re standing on Earth. And that’s just fine. I think, too, about the difficulties inherent in travel. Most Americans are hard-working people, tied to their jobs as cogs in the vast machinery that keeps the country running at top speed; tied down by their mortgages, insurance payments, credit card debt, student loans,…; unable to travel far during their meager two-week annual vacations. So they have to wait – decades — until the machinery spits them out at 65 or 70 before they can venture into the wider world for any appreciable length of time to see what there is to see and learn what there is to learn outside of the American bubble. That is, if their health and stamina and finances will allow such foreign travel at that age. But, I wonder, is that too late? Would a rich, xenophobic bully like Donald Trump get as far in the polls if more Americans had seen more of the greater world in their formative years? Would this TV “reality” showman-turned presidential-wannabe have the chance to embarrass the rest of us like this throughout the world? — then silently make a wish, as if over a birthday cake. One of my wishes, I know, was to leave that snug, smug, all-white small town forever and experience the wider, more colorful world, as soon as I grew up. That wish, at least, thank God, has come true.